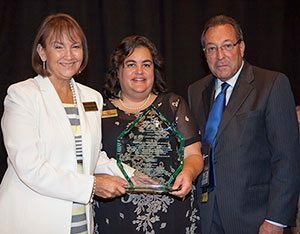 From left, Florida’s Children First Executive Director Christina Spudeas, Deputy Director Robin Rosenberg, and board member Jesse Diner accepted the 2015 Paul C. Doyle Children’s Advocacy Award at The Florida Bar Foundation’s 39th Annual Reception and Dinner for the organization’s Counsel for Dependent Children with Special Needs Project. MAITLAND, Fla. — Attorney Richard Joyce stood before Miami-Dade Circuit Judge Michael Hanzman and stated his 10-year-old client’s case in the simplest terms. “I believe the court has the ability to enforce this child’s rights,” Joyce said. 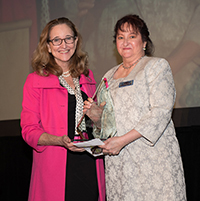 Joyce was there to make sure that his client would not fall through the cracks again, his presence in the courtroom courtesy of legislation passed in 2014 through the efforts of Florida’s Children First, the 2015 recipient of The Florida Bar Foundation’s Paul C. Doyle Children’s Advocacy Award. 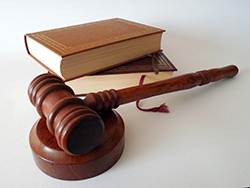 With support from a Florida Bar Foundation Children’s Legal Services grant, Florida’s Children First advocated successfully for passage of the 2014 legislation, which provides attorneys to protect dependent children with special needs who are in the state custody. The Florida Legislature also appropriated $4.5 million in 2014 to fund attorneys to represent these at-risk children. The bills were sponsored by Sen. Bill Galvano and Rep. Erik Fresen. Amy Guinan, an attorney with Florida Legal Services who works on health-care issues, said Joyce’s representation of his young client — a direct result of the legislation — helped spur needed improvements in the wake of statewide implementation of Medicaid managed care. “They were still having to use pre-managed care systems in managed care, and all of the players weren’t quite sure how it was supposed to work,” Guinan said. The case illustrates why it is critical for lawyers to be involved in dependency cases involving children with special needs, which under the legislation include those who reside in a nursing home, have a developmental disability, are human trafficking victims, or are prescribed psychiatric medication. These children can be subject to the policies and actions of multiple state and local agencies and care providers who may not always communicate with each other in ways most beneficial to the child and whose resources are finite. “Having this legislation passed this last year was such a personal, fulfilling feeling of having something lasting,” Spudeas said, adding that judges seem pleased with the results. Florida’s Children First President Howard Talenfeld, a leading children’s rights attorney, called the legislation historic when it was passed last year. Florida’s Children First will work to ensure continued funding, a top priority following a $2.2 million appropriation in 2015.